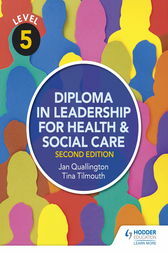 This new edition of Level 5 Diploma in Leadership for Health and Social Care has been fully updated to reflect the changes to the structure of the qualification. Covering all of the mandatory units in an easy-to-follow and thorough manner, this book is perfect for anyone looking to progress in their management career and for existing care setting managers as an invaluable reference guide. -Covers all the information in the qualification thoroughly and in an easy to follow manner with a new and updated design. -Updated to match the Level 5 qualification's integration into the higher apprenticeship programme including the new 'undertake a research project' unit. -Encourage learners to think more about the theory aspect of the qualification and how it is applied in the workplace with 'In Practice' features. -Explore and understand the different methods of assessment and how to prepare using relevant activities.